Today, most of the streets in Munich are mainly designed for motorized vehicles. This has led to a high percentage of concrete space for cars and go-through-traffic at the expense of green space for recreational usage. 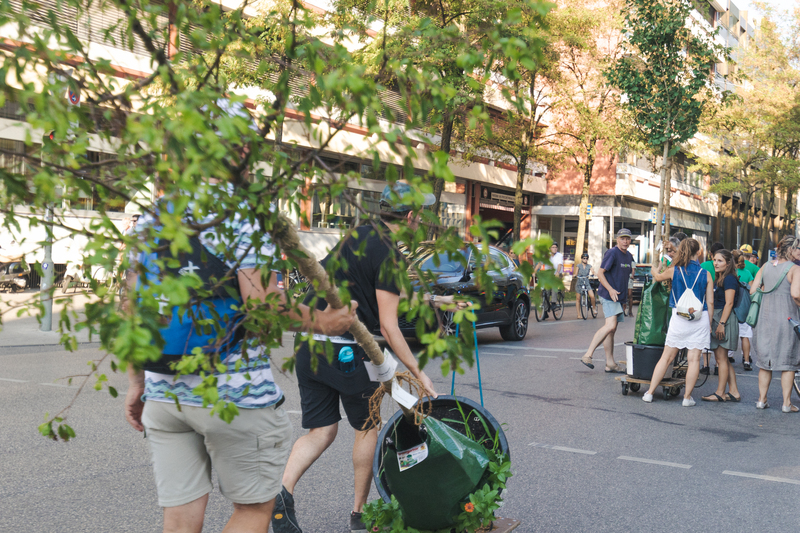 To address this issue and to show alternatives, a greening project was established in the city of Munich, called “Wanderbaumallee” (literally “Alley of walking Trees”). In the past, such projects were already implemented with very positive results, such as trees that were actually planted and remain permanently in the city. During the implementation of the project, 15 “mobile trees” on skateboards were located in an asphalt dominated area and transformed it over a course of several weeks into a green public space with a high quality of stay. The installing of the walking trees was accompanied by an entrance promenade. Neighbours and local shop owners participated in the project, e.g. by taking on responsibility for watering the trees.